I wish I could set up a bird blind and photograph birds every time I go camping. Once again, I am faced with the “I need a bigger/better/faster camera” as I seek to talk about something I saw. Birds, this time. There are always birds and sometimes you never see them (like the mysterious warbler of the Cascades. I still don’t know what bird it is except that it is probably a drab little bird that can hide well but has a beautiful melody). Sometimes they just move too fast: a hummingbird that zeroes in on something red in camp and comes in to hover and investigate and just as quickly buzzes off. The hawk that nearly landed on the big rock by Don’s head before realizing there was a human being and two big dogs right there, so it did an acrobatic reversal before Don could get a good look at it. We had plenty of bird visitors out on Pike Creek. 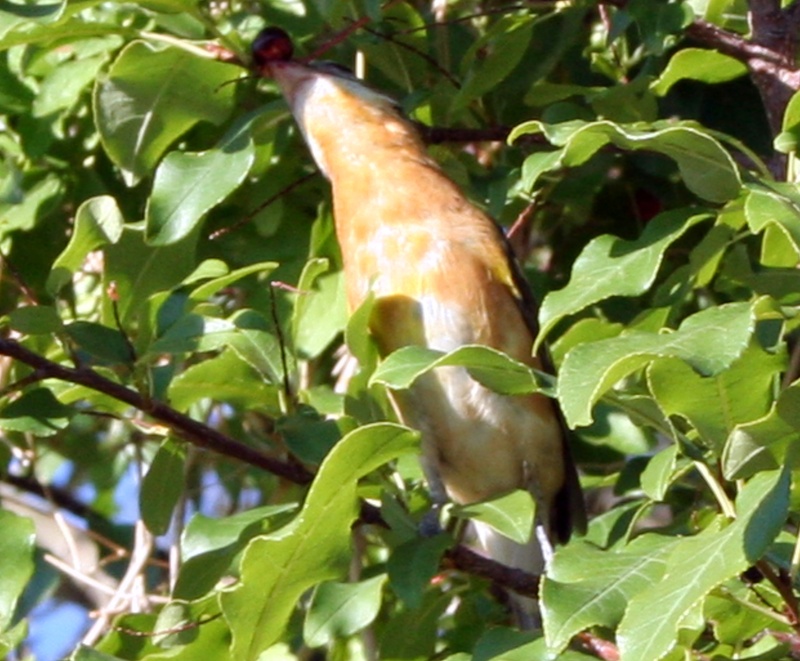 There was a female black-headed grosbeak that was busy making short work of the few chokecherries left. I could get close to her (grosbeaks are normally quite friendly) but she refused to pose. She was rather gluttonous instead. We were visited by sage sparrows as well. Driving in to Fields Station one morning, we counted ravens, crows, turkey vultures and a number of unidentified hawks as well. 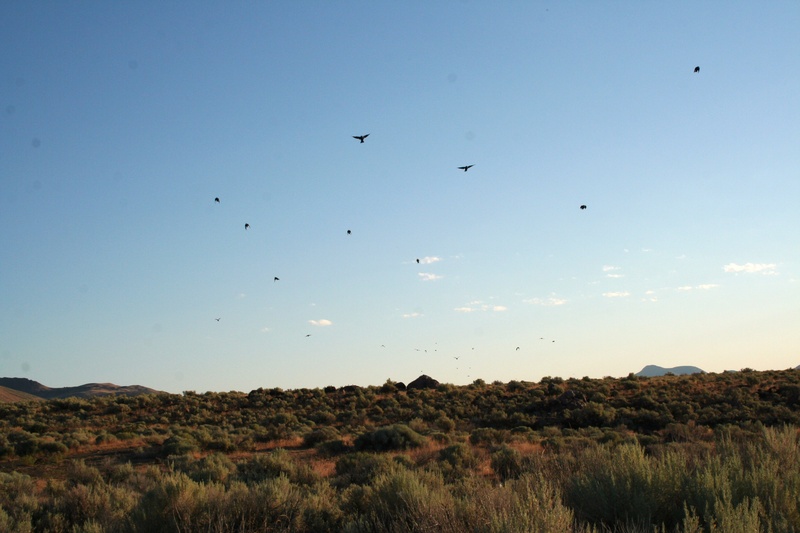 The Western meadowlark is a favorite of ours: the radio station out of Winnemucca always opened business in the Spring to the song of the meadowlark. We also saw some Northern shrikes hunting grasshoppers. Those are striking birds in more ways than one (after I realized I just punned): pretty to look at and quick to kill small creatures that it impales on something sharp, like barbed wire. Of course, we both were watching for Mountain bluebirds (the Nevada State Bird) and we saw several flocks in the juniper-and-pine forests of Fremont National Forest. 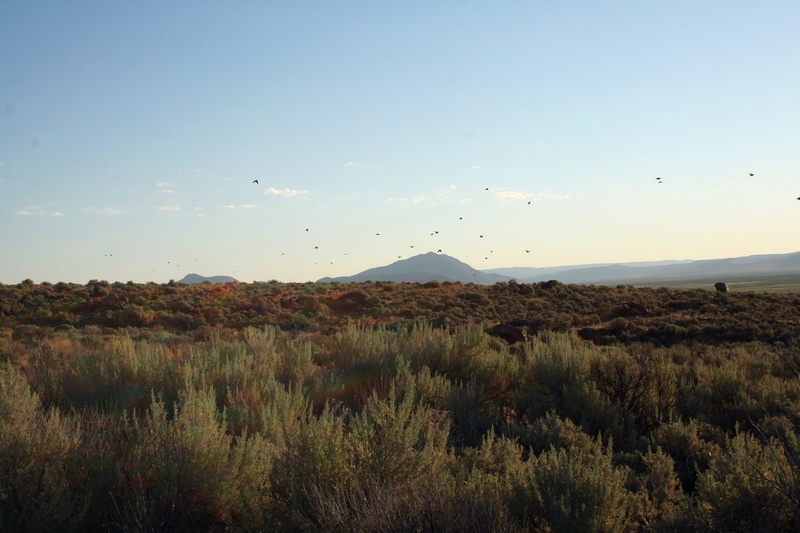 On the same drive in to Fields Station that we counted birds on, we noted a huge flock of something flying south along the Steens Mountain. At first we thought we were watching Canada geese, but upon closer examination, we determined we were following a large flock of white-faced ibis. I took that from the car as we kept pace with the ibises. I always want to call them “black ibis” because they are large black birds with a little bit of white through their eyes. They’re pretty common on the marshes of the Malheur Wildlife Refuge and in the grass by the Alvord Hot Springs. One morning, Harvey and I took a walk down through the empty campsites to where the house-size boulders are all tumbled together. The creek takes a turn south at that point and the tree line follows the creek, so the boulders are shadeless and uninviting as a camp site. But they are unusual and if you climb onto them, it’s a wonderful view of the basin. Shadows were still long but the sun was warm and I was enjoying the promise of a hot day. Besides, Don was back at camp trying to change a flat tire and I didn’t want to be anywhere near. But that’s a story in itself: a long drive to Burns to get a flat changed on the day we had planned on going hiking. 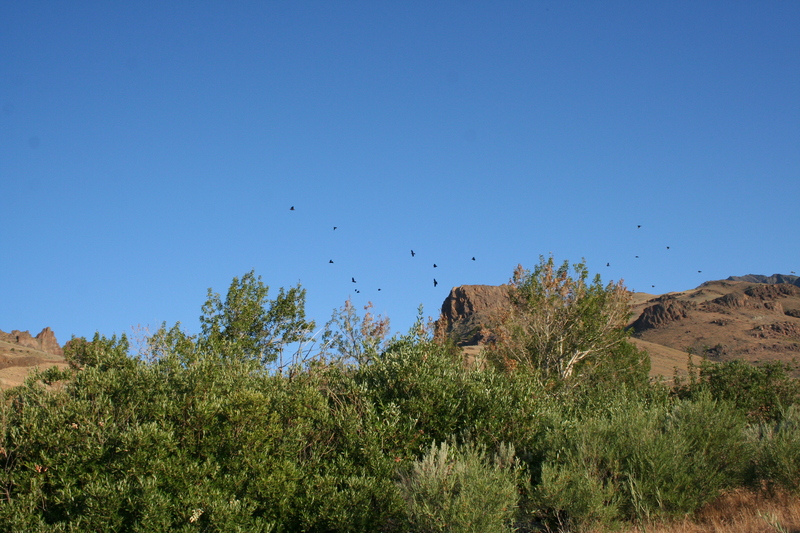 Standing among the rocks, I noticed a flock of black birds coming overhead. And another flock. And more. 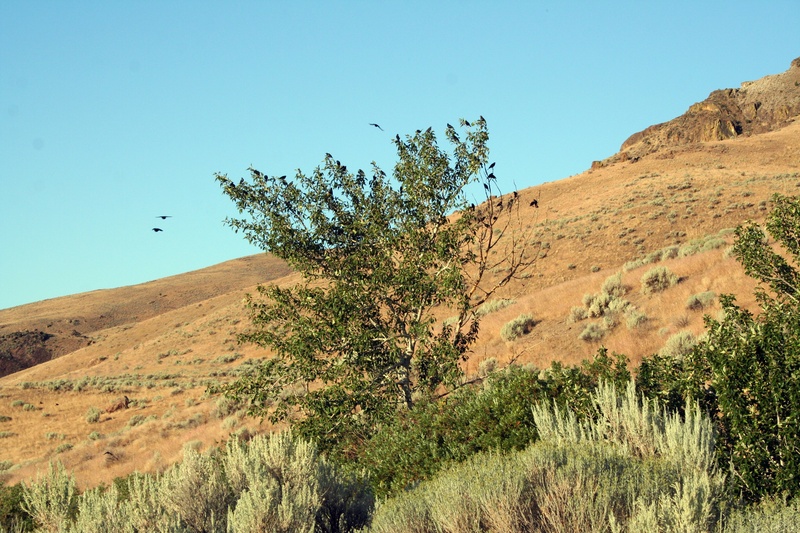 It was a little disconcerting to see so many black birds (there were upwards of hundreds) flying over the sagebrush toward me and settling into the cottonwoods around me. I had a momentary flash that I was Tippi Hedron and someone was watching me, yelling “DON’T OPEN THE DOOR!”. Alfred Hitchcock aside, it was just a huge flock of mixed blackbirds (Yellow-headed, Brewer’s, and Brown-headed cowbirds) chasing grasshoppers. Possibly my favorite encounter came early one morning on a camping trip not so many years distant: we were awakened by sounds in the cottonwoods overhead and a who-who WHO who-who WHO round of calls. A pair of Flammulated owls settled down to peer in the car windows at us, turning their heads and exchanging comments about those crazy humans parked in their favorite cottontail hunting grounds. I asked Don if he thought we would ever see the owls again. 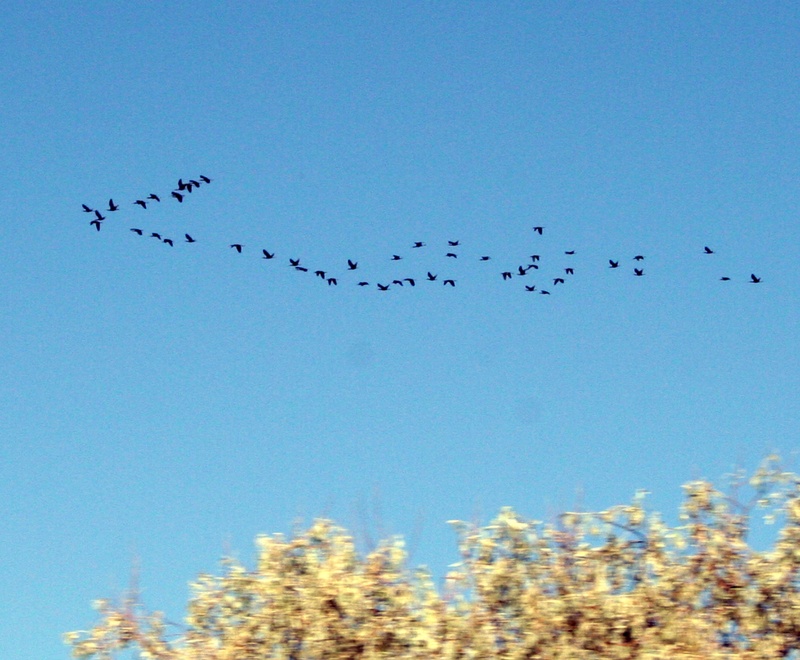 We heard a pair of Great-horned owls at another campsite, but I wanted to see or hear our Flammulated ones again. Don was doubtful that we’d see the owls, but I held out some hope anyway. And in the wee hours of our last night above the Alvord desert we were awakened by the exchange of who-who WHO? who-who WHO? as a pair of Flammulated owls settled into the cottonwoods above it. I rolled over and smiled, content that God was still out there, watching over us and granting us small gifts. I think maybe He comes dressed like a Flammulated owl.